Moving documents to our iPads, we generally use Dropbox or another cloud service specific to an iPad document viewing app. Those documents can be best viewed on the iPad closest to the way they were created by converting them to a PDF. The conversion of documents, like presentations, is easily done while being sent from the desktop by ‘printing to PDF’. With so many documents being created or edited on the iPad now that need to be shared. Saving anything as a PDF to share out would be nice. The folks that brought us Readdle document reader thought that was a good idea too so they have brought us the PDF Converter app. As the name implies, the app converts Word, Excel, Powerpoint, Pages, Numbers, Keynote, TXT, HTML, JPG, PNG, Safari web pages from the iPad into a PDF files so that people viewing the document on other devices see it as you saw it on your iPad. It also means you can share to just about any computing device since PDF viewers are standard across platforms. PDF Converter makes the conversion possible across the variety of iPad apps you may be using via the ‘Open in’ list. When you have a document at the point you wish to share it, just choose the PDF Converter from the ‘Open in’. 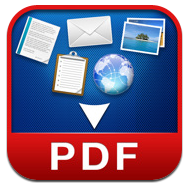 The document will appear within PDF Converter as a PDF that then can be emailed or shared via DropBox. The whole process is done on the iPad, many other solutions require Internet access to perform the conversion. The document to PDF conversion works on Safari Web pages too! It is as simple as changing the ‘http’ in the URL to ‘pdfhttp’ then tap the ‘Go’ button. Being able to share a snapshot of Web pages as a PDF can be addicting though. So far the only negative is we need better ways of grouping the converted documents within PDF Converter since we converting everything. The app has taken away the need to double check if a person we are sharing a document has the right app to view our iPad creations.